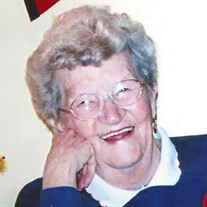 Beulah "Peggy" Quathamer (nee Wood), 94 formerly of Linthicum passed away on November 29, 2018 at MD Masonic Homes. Peggy was preceded in death by her husbands, the late Russell Sears and Robert Quathamer; her son, Robert "Bobby" Sears; her granddaughter, Shannon Zerby, three brothers and two sisters. She is survived by her devoted son, Russell O. "Rusty" Sears, Sr. and his wife, Louise; her grandchildren, Russell "Rusty" Sears, Jr. (Tammy), Donna Wheeler (Eddie), Jill Sears, Robin Russell (Vince), and Lori Erber (Tom); her great-grandchildren, Courtney Johnson, Joshua Sears, Jordan and Jenna Erber; her great great-grandson, Eli Johnson; her brother, Howard Wood (Judy); her sister-in-law, Sue Wood. Peggy is also survived by many nieces and nephews. She was a member of the Order of the Eastern Star #20, and enjoyed knitting, crocheting, puzzles and puzzle books. Peggy especially loved her dog, "Schatzi". The family will receive visitors at Singleton Funeral & Cremation Services, P.A., 1 2nd Ave. SW (at Crain Hwy) on Monday, Dec. 3rd from 4-7 pm. A Funeral Service will be held on Tuesday, Dec. 4th on 1 pm in the funeral home chapel. Interment Meadowridge Mem. Park. In lieu of flowers contributions may be made to Gilchrist Hospice, 11311 McCormick Rd., Ste. 350, Hunt Valley, MD 21031.